Black Bottom Cupcakes are definitely a dessert in my book, but I must be the only one who thinks that way, as just about every coffee shop and bakery that stocks them (including Starbucks) puts these out for breakfast. They are moist chocolate cakes with cheesecake-like centers, rich and decadent – especially if you are eating them in the morning. The cupcakes are tricky to make because you need to have the right ratio of filling to cake and the filling has to hold together in just the right way to prevent it from (a) sinking into the cake completely or (b) detaching from the sides of the cake as it cools. I have made variations many times with varying degrees of success. All were tasty, but none were perfect. Then I saw a gorgeous picture of the cupcakes in an issue of Cook’s Country and had a feeling that their recipe might be the one I was looking for. They turned out perfectly, moist and tender with a very rich flavor that doesn’t let you stop at just one bite. 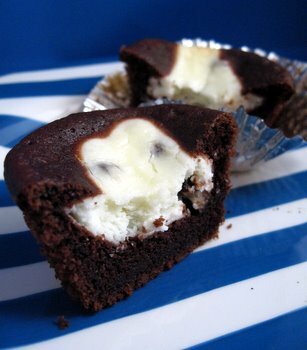 The cream cheese filling has miniature chocolate chips stirred into it for an extra boost of chocolate. I did run into one issue with their instructions, which was that I found their baking time, as stated, to be way off. It called for 25 minutes at 400F! While every cupcake and muffin recipe will vary slightly in baking time, it seems odd that 350F will cook most cakes of this size in 15-20 minutes. Why would a signifigantlyÂ higher temperature require a longer baking time when the cupcake doesn’t contain any special ingredients? Just about every cupcake would be burned to a crisp with those instructions! I didn’t want to end up with a whole batch of burned cupcakes, but I still wanted to test their time.Â I let a few of mine bake at the high temperature for almost the full time and – no surprise – they burned on both the top edgesÂ and on the bottom. Black Bottom Cupcakes are supposed to be decadent and moist and, even if the longer baking time didn’t burn them, it certainly would have dried them out. I’ve given a much lower baking temperature in my instructions below, which should produce better (by which I mean unburned) results. If you cakes aren’t done, just pop them in for an extra minute or two. Remember that you can always add time, but you can never “uncook” an overcooked cake. In a medium bowl, make filling. Beat together cream cheese, sugar and salt until smooth. Beat in egg whites and sour cream. Stir in chocolate chips and set aside. In a large bowl, whisk together sugar, salt, flour, cocoa powder and baking soda. Make a well in the center and add in sour cream, water, butter and vanilla. Stir together until just combined and no streaks of flour remain. Divide cake batter evenly among 24 cupcake liners. Top each portion of batter with 1 rounded tablespoon cream cheese mixture (It is ok to have a little left over). Bake for 20-25 minutes. A toothpick inserted into the side (cake only part) should come out with a few moist crumbs on it. Rotate pans halfway through baking if you are using two racks. Cool in pans for 5 minutes. Cream cheese filling should sink slightly in this time. Remove to wire racks to cool completely. *Full-sized chocolate chips will sink to the bottom of the cupcakes, while miniature chips will remain suspended in the cream cheese center. I love black bottom cupcakes anytime I get them. I love the ream cheese part the best. I will have to try this recipe soon. Cook’s Country or Cook’s Illustrated always have the most successful recipes. Thanks for the heads-up on the time/temp! How much butter did you use? The recipe says “1/2 butter” but I wasn’t sure if it was 1/2 cup or 1/2 stick. Just finished baking these and they are wonderful!! Thank you for the info on baking time, they turned out perfectly!! Oh, I forgot to add I used 1 stick (1/2 cup) butter. These look delish! I discovered your blog about a month ago, and I just love it. I tried the flourless PB cookies last weekend, and they were marvelous. I always have dessert for breakfast then you don’t have to feel guilty about it. Considering that muffins, french toast, pancakes, waffles, coffee cake all fall into the category of sweet enough for dessert, cupcakes, rice krispy treats and other classics make a great breakfast in a hurry. At some point I was eating fresh fruit with yogurt on top, but its so much better with a scoop of vanilla ice cream and more filling. If you figure 300-500 calories for breakfast and substitute out then you don’t have to worry about having it later in the day in addition to your meals. i halved this recipe just to try it out, and they turned out beautifully, even if i forgot to add the vanilla. what’s more, i baked the leftover cream cheese mixture in muffin cups as well, and they made delicious mini-cheesecakes. i think i’m using the above recipe as my default cheesecake recipe as well. once i try it out and tweak it if necessary, that is. thanks! I made these cupcakes last night and they were, far and away, the best cupcakes I have EVER eaten. They were so moist, and tasted just like a little cheesecake tucked inside of decadent chocolate cake. Typically, I don’t like cupcakes, as I find them too dry and the ratio of cake to frosting to be too high, but these blew all those cupcakes out of the water. I baked them in one of those silicone cupcake baking trays (my first time using one of these), and it worked for well (esp. as I didn’t need to use cupcake liners). I didn’t have mini choc. chips on hand, so I put some regular-sized ones in the food processor for a few minutes until I got the desired size. When I added this to the cream cheese filling, it gave it a cookies-and-cream look, and it tasted great. I also didn’t have dutch-processed cocoa powder on hand, so I used the regular stuff. Thanks for the note on the baking time as well. After 20 minutes in my 350-degree oven, they were perfect! Look forward to trying out more recipes soon! Thanks! I made some black bottoms a while back. An interesting trick to this is to mix in some blackberry jam (or whatever flavor you prefer) into the cream cheese. Quite fantastic. What a flashback! My old college roommate’s mom used to send her these in her care packages, and I remember how well they held up in the shipping (yum.) So I decided to make them for a sick colleague to accompany the meal I made for him. The instructions were great, and my cupcakes came out perfectly. I used a regular sized ice cream scoop to scoop the batter, and a small ice cream scoop for the cheese mixture. Using the scoops there was no waste. I delivered his meal warm, and I mentioned to my friend that these taste best when cool so the cream cheese filling has a chance to set. I had no self control and ate one warm, who can resist? Next time I think I would throw in a few more chocolate chips, or sprinkle a few extra on top before baking. I loved these, check them out on my site. I made these and baked them at 350 and they were incredible. I’m making them again tonight. Thanks for the great recipe and beautiful photo. hi Nicole! first thing first, i LOVEEE your blog!! and u have inspired me to start my own one! anyways, i baked these the other day and they turned out sooo wonderful! i put on the final product on my blog and have a link link back to your website, i hope thats ok with you! i’ve made it yesterday. some time igo, i made another recipe that did not work. your recipe is perfect! thanks for sharing! I tried out this recipe today and it turned out fantastic! Just wanted to let you know I put a link on my blog back to your website. Please let me know if its fine with you. I tried a different recipe before of black bottom cupcakes and the cupcake part was so dry, so disappointing, I wasted by money and energy! Please tell me if this is a moist cupcake. Anyway, is it possible to use a regular cake recipe as a base for this cupcake? Thank you. Ela – Sorry to hear that you didn’t have good results with the other cupcake recipe you tried. This is a moist cupcake recipe. You can use “regular” cupcakes as a base for this filling, but you will get a better result with this recipe. This cupcake is moist and dense (brownie-like), so it can support the weight of the filling. With other recipes, it may sink to the bottom of your cupcake. These are amazing! Came together so easy, and were very moist and sooooo tasty. The chocolate part isn’t overly sweet but has a rich chocoloate flavor, which goes really well with the cheesecake portion. I made these for a baby shower and they disappeared. Hi! Is there anything that I can substitute for egg in the filling? I have an egg-allergic child. Thanks! I just made these and I was a little disappointed because I should have used more chocolate chips than suggested on recipe. Thank-you for the temperature heads up! I baked mine at 400 for 10 minutes (a few moist crumbs on the toothpick) and let them stay in the pan another 5 minutes. The cake part was perfectly tender and the filling was gooey. I’m chilling them up in the fridge now. I didn’t care for these too much because I didn’t think the cake tasted very good (even though it was as tender as could be, it didn’t have much chocolate flavor). I am curious to try these again tonight after they’ve been in the fridge though! Update: Sadly I did not like these very much, nor did my husband…the fridge did firm up the cream cheese filling nicely, but it just wasn’t that exciting at any consistency, and the cake was not nearly as good as my favorite chocolate cupcake recipe (The Ultimate Chocolate Cupcake by cooksillustrated). It seemed like between the taste and baking instructions, they fell asleep at the wheel on this one. They are usually so reliable, and 1 out of a million recipes as a flop ain’t bad…still curious what they were thinking about the oven temp though! Wish I had the original issue to read their explanation on that!